Balayage vs Ombre – what’s the difference and which technique is the best for you? Find out all that and more in our hair color guide below! Hey there! 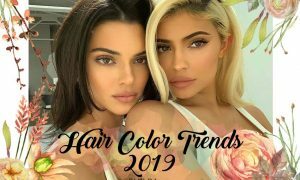 There are so many kinds of hair coloring trends and techniques out there. From ombre to flamboyage there’s so much to choose from! Each of these techniques will give you a different look but one thing they all do is add texture and definition to the hair by darkening or lightening strands. 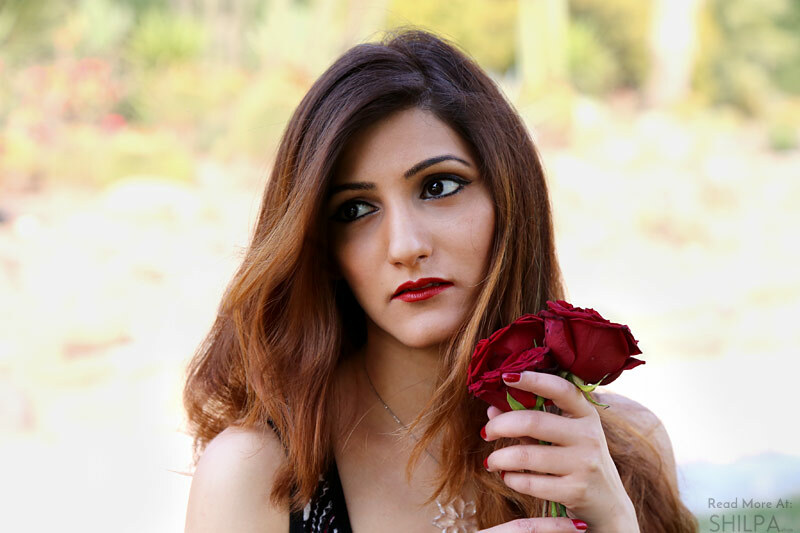 So let’s take a look at what each technique is and find out which one’s for you as we answer all your questions regarding balayage vs ombre. Balayage is a freehand hair colouring technique that originated in France in the 1970s. It’s a new and popular method of applying color by hand as apposed to the traditional foiling. Because of this, the transition is more subtle and has a gentler look, overall. Balayage is aimed at making the hair look sun kissed and as natural as possible. Because of this, celebs have been embracing this look, making it one of the hottest hair color trends these days. It’s derived from a french word, meaning ‘to sweep’ and is pronounced as ˈbaləjɑːʒ. Ombre hair is a another type of hair coloring where the color gradually fades or darkens from the roots to the tips. The area where the colors meet is more visible and prominent. The overall look here is bold and striking. In Balayage coloring, natural sun-kissed highlights may be seen throughout the hair whereas an ombre is more noticeable and stark. Ombre creates a gradient, whereas balayage only adds unevenly placed highlights. The transition in balayage is more natural and is low-maintenance than an ombre. 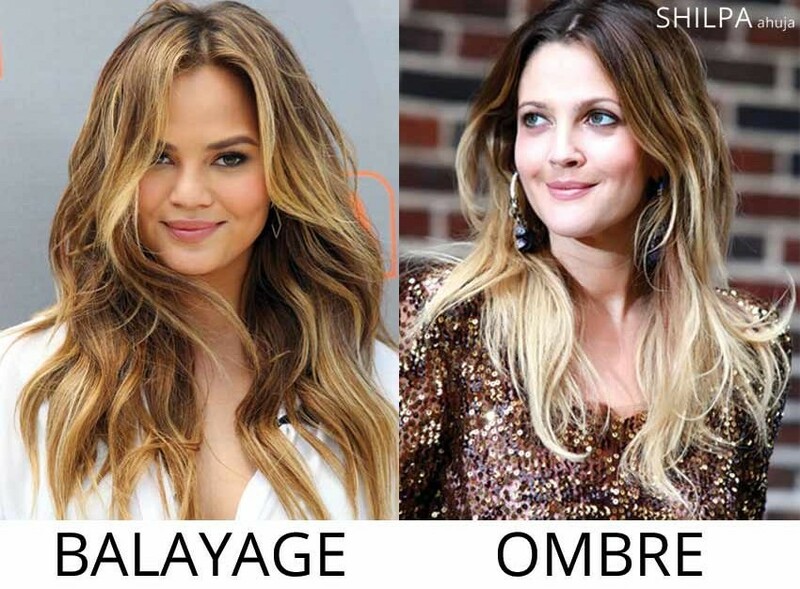 Between balayage vs ombre, I’d say my personal fave is balayage hair. If you want something that’s not as bold as an ombre but also not as natural looking as a balayage, sombre is for you! It’s a softer and seamless version of ombre and is colored in a way to create a not-so-abrupt contrast from the roots to the tips. Typically, a sombre only creates a gradient within two shades of hair color, hence the subtlety. Highlights are done with foil and brush to separate colored strands, whereas balayage is done without a brush. This makes the highlighted streaks more distinct and intense. Unlike balayage, highlights are seen more clearly against the rest of your hair. Should I Go for Ombre or Balayage? Due to the way the color is applied, ombre is more for those who want an edgy and bold look and balayage is great for anyone looking for a softer and natural look. Or you could go for a mash-up look of the two – a balayage ombre. 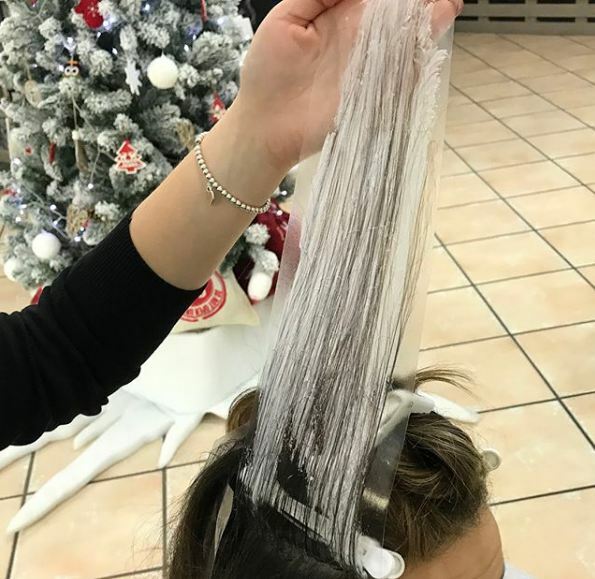 A new and popular hair coloring technique where transparent adhesive strips are used instead of foils to color the hair. The end result may be similar to that of a balayage. The differences here are the hair coloring techniques. Flamboyage uses adhesive strips while balayage is done freehand. The end results of both are more or less the same with the been-at-the-beach effect. If you’ve decided to get balayage for your hair, here’s all you need to know before setting your salon appointment or doing it yourself! A balayage can be done either in the convenience of your home by yourself or at a salon by an expert. In case you’re going to a hair salon, try to find a picture of the look that you want and show it your hairdresser to avoid any mishaps. 2. How Much Does Balayage Cost? Being a new and popular trend, a balayage is more likely to cost you more than a regular coloring session or even highlighting. The cost may vary depending on where you live but the average is 150-200 USD. In India, expect it to cost above 4000 INR. 3. Can I Do Balayage on Short Hair? 4. 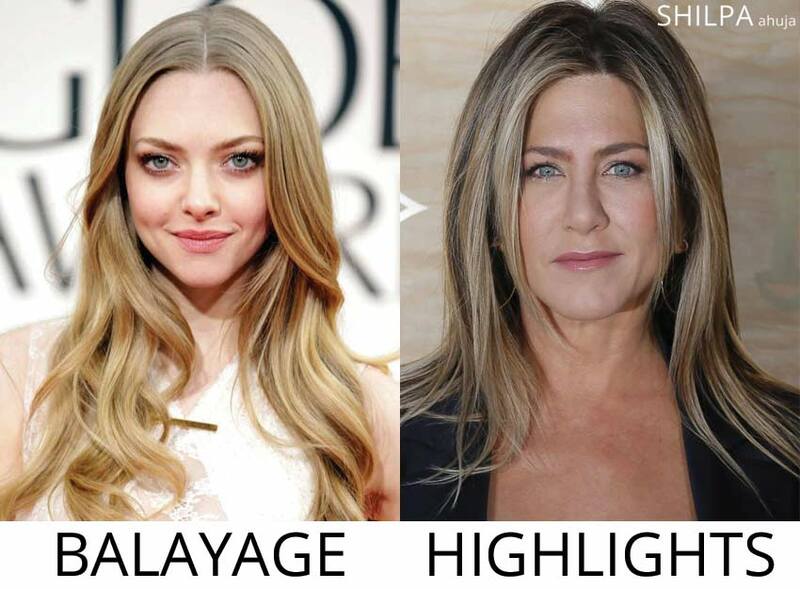 Can You Go from Highlights to Balayage? You can, but the balayage may not turn out as natural looking as you may want because of the highlights underneath. But then again, it depends on the colors you’re going for. Try to choose a shade that’s closer to your highlights so they blend easily. 5. What Shades Should I Go for? Different colors suit different hair textures and skin tones. For a natural, sun kissed highlights look, go for no more than two shades lighter or darker than your current hair color. If you want a bolder look, go for a conspicuous pink or blue, or choose two colors! 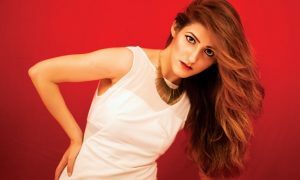 Also check out our article about lots of hair color ideas for balayage, ombre and trendy hair highlights. 6. Does Balayage Use Bleach? It would depend on the color you’re after. If it’s three or more shades lighter than your original hair color, then yes, your hair needs to be bleached. 7. How Long Does a Balayage Take? It would typically take you around an hour – thirty minutes to apply and at least thirty to leave it in. Also, if you want a haircut along with your balayage, it’s best to get it cut or trimmed before you color your hair. If you do it the other way round, it’s gonna alter the final look. 8. What to Do After Balayage? First things first, take countless selfies of your balayage hair, post them on Instagram and let the whole world see your gorgeous new hairdo! And for the next 24 hours, try to stay away from shampoos, heat and anything else that could potentially ruin your coloring. 9. How to Maintain Balayage? Don’t shampoo too often. The more you do this, the quicker it fades away. And when you do wash your hair, always, always use a shampoo and conditioner meant for colored hair. In case you’re into outdoor activities or work out everyday and shampooing is a must, try using a dry shampoo every once in a while. 10. How to Retouch Balayage Highlights? Depending on how intense you want your hair color, you can retouch once a month or once in six months. If you’re retouching your hair at home, be careful about the sections you’re highlighting to make sure you don’t end up evening out your hair color. 11. How Long Does Balayage Last? Normally, it will last you around three months but the beauty of ombre balayage is that it looks stunning even when it’s fading away. You can make your coloring last longer by using color protectant conditioners and generally taking good care of your hair. 12. How Often Should You Get Balayage? This depends on how many times you shampoo and if you’re okay with having a faded balayage. However, if you want the initial look to be constant, you’ll need to get it retouched every month. If not, once every six months is good. 13. How to Fix Balayage Gone Wrong? Firstly, I’m sorry about your balayage. Secondly, don’t worry, it can be fixed. Your best bet would be to get an all-over global coloring of whichever color is most prominent in your hair to cover it all up. Or just go back to your salon and ask them for suggestions. Or if you’re feeling like experimenting, get a bob haircut. All problems solved. The kind of ombre that’s more evident and has an abrupt color change is completely out. 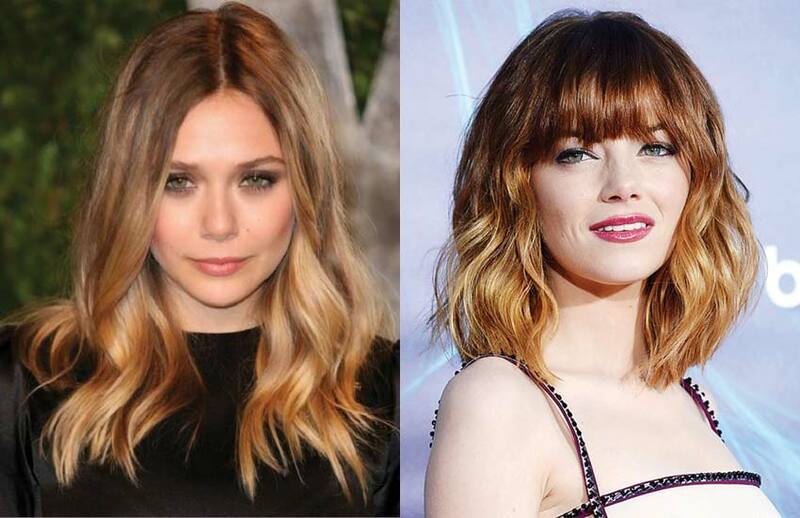 Celebs are now heading towards the more natural looking ombre which is the sombre or a balayage ombre. And we’re also seeing them all over the runways! So that was our guide on balayage vs ombre and the latest hair color trends. What are your thoughts and opinions? Let us know by tweeting @shilpa1ahuja!